"THIS IS Central Park and we're gonna rock and roll!" screamed Noddy Holder, and God knows why but it worked. Rock and roll we did for the first time at the Schaefer Beer Concerts and it sure made it a lot more fun than just sitting there listening to another pleasant evening concert. Although the amps were so loud that half the concert was pure white noise who cares? 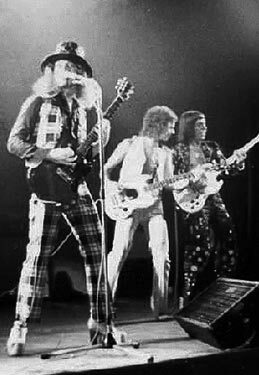 To me Slade always looked like comic strip characters onstage especially now that they're completely dressed in black and white. Noddy, dresses in checked three piece suit, looked like a typically American corcob pipe smoking hillbilly who had stumbled upon a mirrored top hat. Dave was dressed in his usual impeccable bad taste. No longer a slick silver coated 'bullet' he now resembles a penguin in his mirrored black midriff-baring tails and cuffed pants. But stealing the scene was the elegant Jimmy Lea who took off his flash black jacket to reveal his pure white crusader outfit. Don, as usual was hidden behind his drums. Although the Flame album is in the stores the audience clearly haven't bought it as they didn't recognise any of the songs which comprised the majority of the numbers. the only ones to wgich they responded were Gudbuye T' Jane and Mama Weer All Crazee Now, both of which have gotten limited airplay in the States. But perhaps "responded" is incorrect. They went literally mad during these numbers. The deliberate, exacting beat of the music physically lifted them out of their chairs to dance, to stand on the chairs clapping, to crowd in front of the stage. And of course the worst had to happen. Several people got involved in a fight with the security guards just as Slade started another rocker. Noddy stopped the show. "Hold It! We don't want the security guys getting heavy down here. All you security guys better get out. We don't want any of that crap." Of course the security men didn't listen; they couldn't with all the fights going on. But for the first time in my experience a rock and roll star cared enough to stop the show and try to get things straightened out. It gives you a key to what Noddy is really like. He seems concerned for the fans, but he also seems concerned with being powerful. he likes to control the audience, almost to the point of making them do absurd things just to prove that they are his. he made animal sounds and got the audience to repeat them. made obscene noises and the audience repeated them. He could have gotten them to do almost anything and he knew it.......it almost seemed as if he were mocking them, but perhaps not. Jimmy also seemed involved with the kids. When Slade started The Banging Man and he had nothing to do for the first few moments he spent them staring out into the crowds, checking them out. he smiled at the kids waving to him with Slade written on their fingers. He looked as if he wanted to know exactly who was there, but more importantly who wasn't. Dave was the opposite. He seemed mostly concerned with prancing around and being a delightful show off. As for me, I miss the old Slade who did each song for three minutes and that was it. With the Flame album they are obviously trying to broaden their music and their audience and while they might succeed with both they could lose everything that made Slade the fabuously raunchy band that it was. But Slade loves New York, and the New Yorkers at the concert wholeheartedly loved Slade. they even brought them back for a second encore after the audience lights went up and Slade proved their gratitude for probably the biggest reception they've received in the U.S so far by doing an outrageously exciting, exhausting version of Sweet Little Rock 'N' Roller. Perhaps their road manager summed it up perfectly after the concert as the security guards were dragging out various unconscious bodies - kids out of their minds on pills and liquor, boys injured in the many brawls, 17 year old girls who'd been overcome by Slade and the heat - "You know you've been at a rock and roll concert."